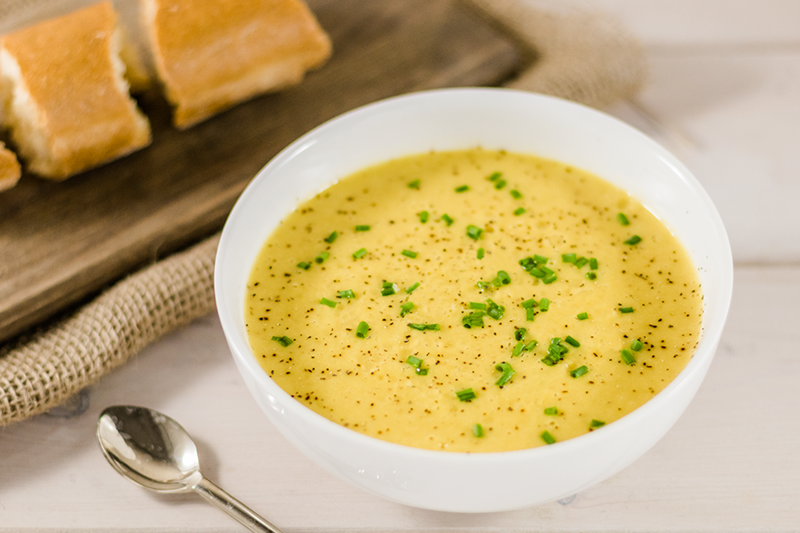 Get a healthy dose of comfort with this cheesy vegan potato soup recipe. 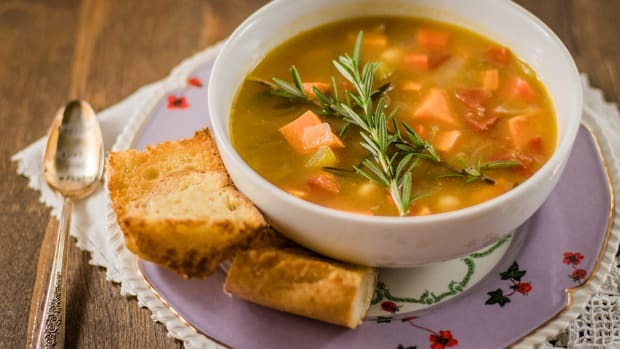 With warming, hearty ingredients this soup is perfect for chilly days. A sprinkle of chives provides an herby twist that complements the creamy flavor. Traditionally, potato soup is made with cheese, heavy cream, and bacon. All of those heavy ingredients make potato soup a meal that’ll likely leave you with a stomach ache. But with this healthy recipe, potato soup becomes a nourishing bowl of coziness. 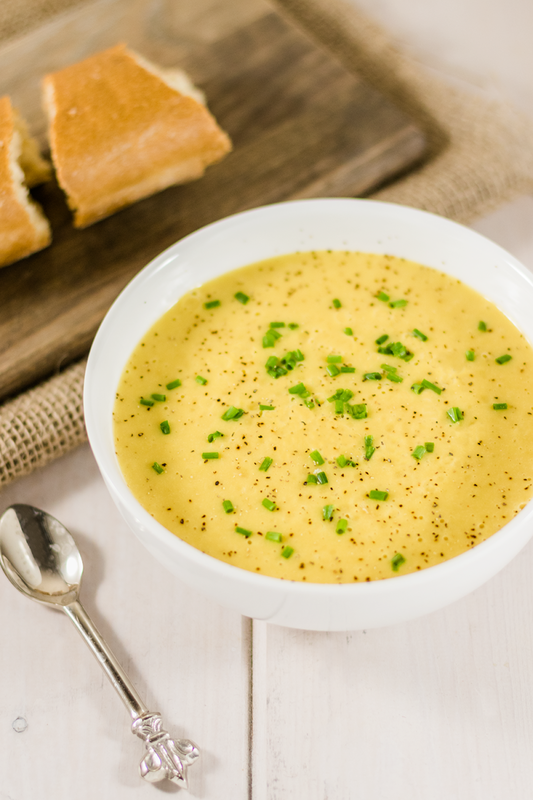 This nutritious potato soup recipe uses Yukon gold potatoes, nutritional yeast, and almond milk to create a cheesy soup without the dairy. Yukon gold potatoes are creamy and have the perfect flavor to use in a potato soup recipe. Plus, they have a health benefit you won’t find in ordinary white potatoes. 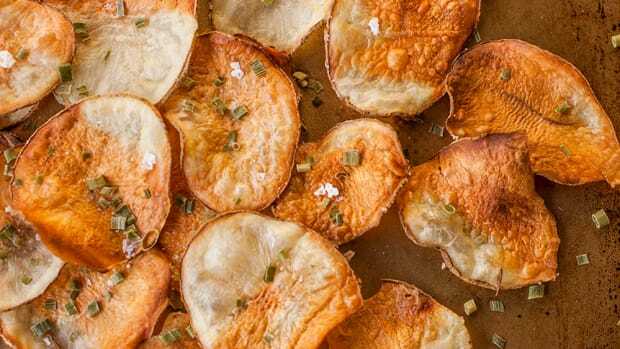 Gold potatoes get their hue from carotenoids which may help protect the body from cancer and cardiovascular disease according to a study by the USDA. 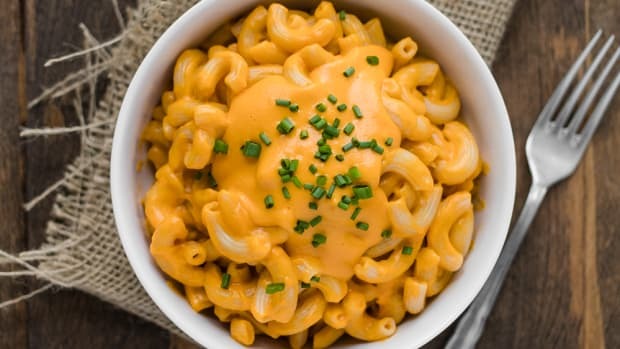 The study also suggested that the lutein and zeaxanthin found in gold potatoes may help prevent age-related macular degeneration. The condition often leads to visual impairment or blindness. 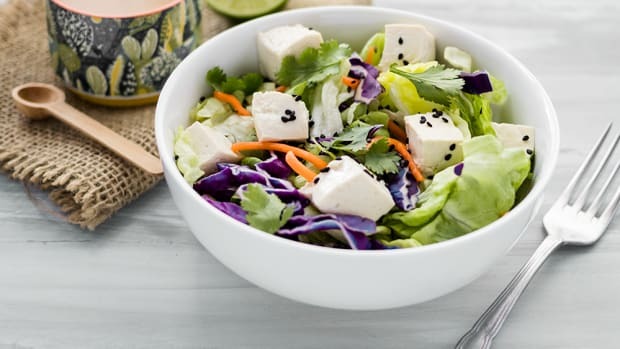 Consumption of foods rich in lutein and zeaxanthin may help protect the eyes. 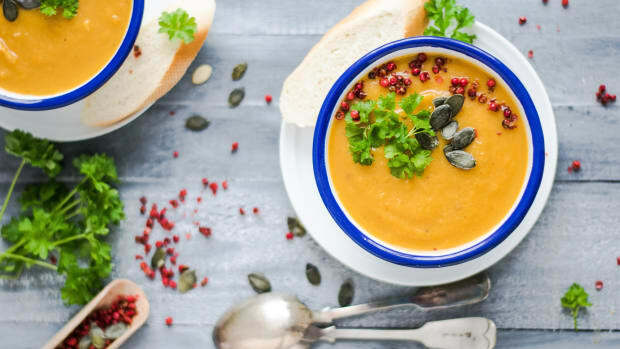 The key flavor ingredient in this soup, nutritional yeast, also boasts its own bevy of health benefits. 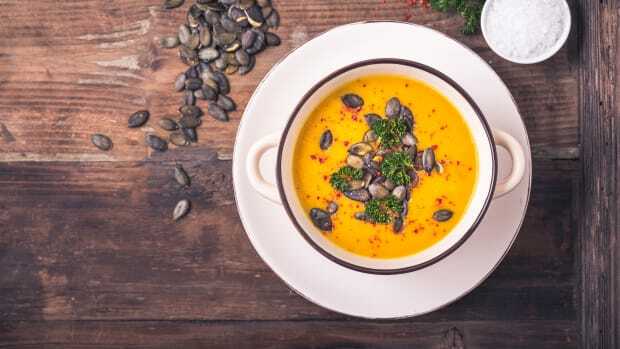 Nutritional yeast which adds the cheesy flavor to this vegan potato soup, is also a great source of vitamins and minerals. It’s often fortified with vitamin B12-- an essential nutrient that is usually only found in animal products. It also is a source of vitamins B1, B2, B3, B6, and minerals including iron, folate, and zinc. Nutritional yeast is a protein-rich food making it even more ideal for plant-based recipes. It boasts the rare quality of being considered a complete protein, since it provides 18 amino acids. It also is a great source of fiber which means it’ll help keep you full longer. As mentioned before, many potato soup recipes use bacon. 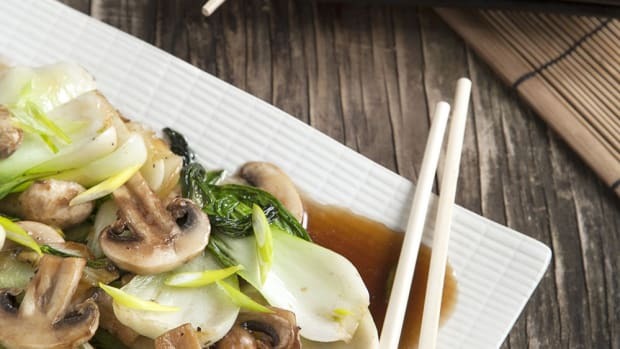 If you’re craving a "meaty" protein in your soup, try one of these vegan bacon alternatives. Mushroom-based bacon pairs particularly well with potato soup. Also, feel free to make this soup chunky style if preferred. To do so, only transfer half of the soup to a blender. Blend until smooth then pour back into the pot. Stir well and you’ll have yourself a creamy yet chunky potato soup. 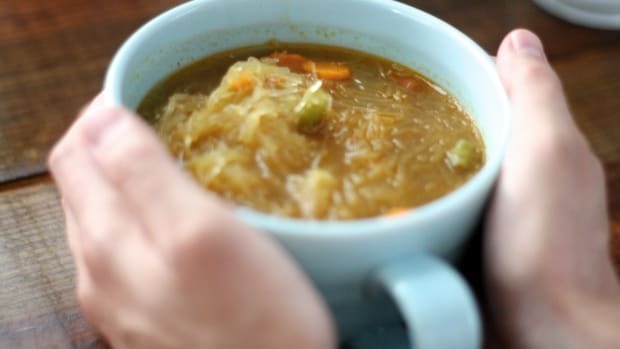 Store any remaining soup in an airtight container in the refrigerator for up to five days. Heat oil over medium heat in a large pot. Add the onion and saute for four to five minutes, until onion is softened and translucent. Reduce heat slightly and add garlic. Saute for another minute. Add potatoes, vegetable broth, bay leaf, and sea salt. Bring to a boil and then reduce to medium heat. Simmer covered for 20 minutes or until potatoes are fork tender. Let cool for ten minutes. Transfer soup to a high-speed blender, in batches, if necessary. Add almond milk, nutritional yeast, pepper, and paprika. Blend until completely smooth. Taste and add more nutritional yeast and/or salt and pepper if necessary. Return soup to the pot and heat over low heat until warm. Ladle soup into bowls and garnish with chives.